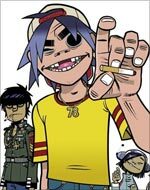 I wasn't a fan of The Gorillaz' Plastic Beach album, which strayed too far into "Damon Albarn mumbling aimlessly into a microphone" territory to live up to the band's lofty heritage of pop-indie-hip-hop crossover. But their brand new, non-album single Doncamatic gets a full-on Fab Macca double thumb salute for its laser blast of Daft Punk synths and smooth, androgynous vocals from Mancunian newcomer Daley. The song's groove and title were both inspired by the DoncaMatic, one of the world's first drum machines - released in 1949(!!) 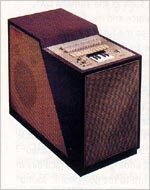 Much like the Mellotron - the instrument you hear at the start of The Beatles' Strawberry Fields - it used loops of quarter-inch tape to reproduce pre-recorded drum sounds. That's a picture of one at the top of the page. Musical geekery aside, this is a sparkling return to form for Damon Albarn's cartoon band. Don't just take my word for it. Here is what everybody else on the internet has to say in their charmingly illiterate way.